The past week has been exceptionally calm on the Bitcoin markets. This is not surprising, since most people were on holiday, celebrating the new year. Coming out of these holidays, we see volume return to the markets, as had been remarked last week. 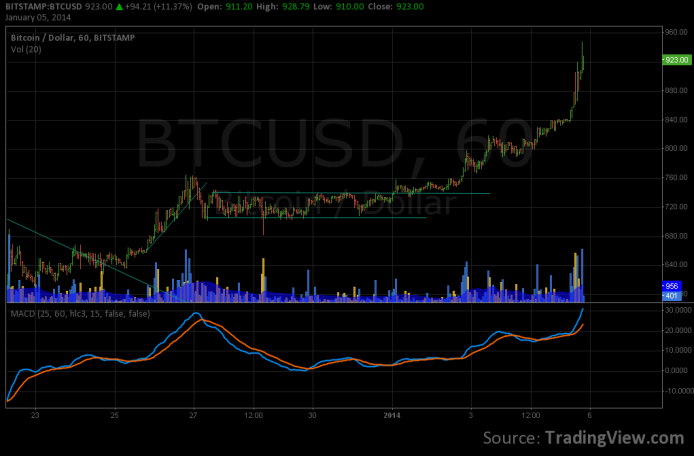 We started seeing an upward breakout from our rectangle on the 1st of January, with a smallish spike in volume. This in itself could have been a false breakout. Volumes started picking up late the next day, with increasing buy strength. The price steadily broke the traditional resistance at the $820 to $840 level. The upward rally that followed has characterized this buy strength and volume, which shows that it is a true rally. This week we shall begin using a new technical indicator, the MACD. As seen in the following chart, the MACD indicates that we are in a bullish trend. The MACD is highly diverged currently, which indicates the end of the upward movement in the very short term. A small correction to $880 levels would be unsurprising in the short term. The current rally is expected to run up at least till the strong resistance level of $990, and at the current rate we would reach this price level within 3 to 4 days. On a side note, the new Chinese exchange Huobi still seems to be driving price and volume movement. It is still unclear if and how this will continue following the Chinese government’s January 31st deadline.